Free software development, also known as 'open source,' is a unique phenomenon in which volunteer programmers collaboratively develop software on the Internet, and then make it available, along with its source code, for no cost. This process is particularly interesting in that many free software projects are successfully competing against traditional, proprietary products in the marketplace. This paper discusses the history and origins of free software, then considers various studies of the phenomenon from economic, sociological, and economic perspectives. Finally, I propose several possible social, political, and economic implications of free software. Copyright (c) 2002 Greg Michalec. Nancy, Beth, Brian, Mikey, the Denizens of the Green Machine, ATP, Maggie, Maxwell, Mom & Pop, Dmitri, Bill, the WCP Classes of 2000 & 2002, and everyone else who supported me, or at least tolerated me, through this three year endeavor. We live in an age of increasing corporate power. The news of the latest mega-mergers is piped into our homes by giant media conglomerates. Each day, power, influence, and control become more centralized and consolidated into fewer and fewer organizations - mammoth bureaucracies that edge their way into every aspect of our lives. Technology only aids this process, and one of the most powerful entities today is the software company Microsoft. With over $40 billion in liquid assets1, they are the untouchable of the free market – widely recognized as a monopoly, yet no one seems to have the will or the power to hold them back. Microsoft has successfully usurped IBM's place at the vanguard of the computer industry, conglomerated market share from other technology heavy-hitters, and now is managing to survive an antitrust lawsuit. Neither the free market nor the U.S. Government have been able to slow down Bill Gates’ behemoth. Yet, there is one product that is slowly eating away at Microsoft’s monopoly share of the software industry. It has been sneaking in through the back doors of server rooms for years. It has no advertising budget. It has no billion-dollar war chest. The closest thing it has to a marketing campaign is an icon of a cute, smiling penguin, which may have eaten a little too much herring. This product - Microsoft’s biggest fear - is an operating system called Linux, which is but one product of the phenomenon of Free Software. The term ‘Free Software' refers to software that has been distributed without restrictions on use. This means that it is not only available for use with no monetary cost, but that one also has access to the inner workings of the software – the source code – to make any changes, fixes, additions, or adaptations one chooses. While such software is often protected by legal licenses, these licenses generally only serve to protect the software from having further restrictions placed upon it. A free software project constitutes an extremely complex system. The Linux kernel consists of over 3.1 million lines of code2, and has thousands of contributors who are scattered all over the world, most of whom have never seen each other. Though English is the lingua franca of most large international projects, many developers only have the most rudimentary knowledge of it. Yet, collectively they are able to create a piece of software which performs millions of complex routines, runs on many different types of hardware, and allows hundreds of devices to communicate with one another – and they give it all away for free. What is particularly interesting about free software, also known as ‘open source software,’3 is that it is usually developed by several individuals in collaboration with each other via the Internet, usually for no pay, yet it results in products that are of equal or greater quality to those produced in traditional software environments. This project examines what free software is, analyzes various explanations for the phenomenon, and suggests possible implications of free software, both theoretical and practical. converts a temperature given in Fahrenheit into its Celsius equivalent, and displays the result on the screen. When a software developer wishes to contribute to a free software project, this is usually the process that is followed: The developer downloads the source code from a central repository. These repositories are maintained by the project itself, and often linked from a web page related to the project. This accounts for some degree of authenticity – the project members take pride in their work, and therefore would not distribute malicious code; it is up the developer to assess the trustworthiness of the project, but this is the case with all Internet downloads. Once the source has been obtained, developers may explore it and locate the area they want to change. Source code almost always contains ‘comments’ - side notes in plain English (or another language) describing what each piece of code is doing, notes as to the usage of particular sections, explanations of design choices, etc. which aid a developer in navigating the code. Additionally, the documentation to a piece of software is most often included with the source code. Developers may also find information on the project’s website, or they may subscribe to the project’s email list and ask the other developers about the code. Once developers have made the desired change, they usually generate a file that compares their changes to the original state of the code. This file is automatically generated by a common program, and is called a ‘patch.’ The developer then submits the patch to the rest of the development community, usually via an email explaining the purpose of the patch (although in some larger projects the patch is given to an individual who maintains a particular section of the code). At this point, the patch is examined for quality, to make sure it behaves as intended, keeps in line with design goals, does not negatively affect other portions of the code, etc. This is sometimes done by the consensus of the community via email, or by the aforementioned maintainers, or another individual who acts as a gatekeeper. If the change is acceptable, it is then ‘merged,’ or combined into the existing code, so that future developers will download the change. In the early days of computing, the 1960s and 70s, computers were fairly specialized, simple machines used only by highly trained professionals. In order to make the machine do anything useful, an operator would have to do a fair amount of programming. Because it was necessary to optimize one’s programs to use the early hardware in the most efficient way possible, and because operating systems were not nearly as sophisticated as they are today, operating a computer required an intimate knowledge of both the underlying hardware and software. Thus, it was common practice for computer operators to share the source code of the programs they wrote. There was no software industry as we know it back then – most of the software used was either produced by the hardware manufacturer and shipped with the machine, or it was custom-developed in-house. The primary value lay in the machine; software was not sophisticated enough at that point to provide much value of its own. This slowly began to change in the late 1970s and early 1980s. Hardware became powerful enough to support more sophisticated applications, and thus machines became more generic, while software was tuned to specialized tasks. With the invention of the microcomputer, computer hardware was becoming more common, and thus its price was falling. Corporations such as IBM, Digital, and AT&T anticipated that computer software would hold much greater value in coming years; thus, they sought to protect that value. They began to implement restrictive licenses and non-disclosure agreements with the software they shipped. The era of sharing software was over, and a new industry was born. Stallman found such restrictions unacceptable. He could not continue working in an environment where he would be forced to deprive others of useful information, nor could he stand by and watch as the effects of proprietary software divided his hacker community. Also in 1985, Stallman authored the “GNU Manifesto,”15 which called for other hackers to join the project while championing the benefits of sharing source code. While the GNU project still has not completed its base operating system, it rapidly developed all the necessary programs and utilities needed to use an operating system effectively. Because these programs were compatible with other types of Unix (of which there were many), and were designed to run easily on many different types of computers, they quickly became popular, and gathered support for free software. Many exceeded the quality of proprietary programs that came with the various other Unixes, while others provided new services that simply did not exist in closed source software. Members of the Berkeley group began to feel used. AT&T’s intellectual property rights were restricting their work.20 They began to separate out the code they had developed on their own, and released it separately in 1989. The license this code was released under was extremely loose: it only required that the license remain intact, and that any released product based on the BSD code must make some mention of that fact in its documentation.21 There was no requirement to release source code, as exists in the GPL. The Berkeley group continued to identify the code in their BSD OS release that they had developed in collaboration with AT&T, and replaced it with code written by programmers on the Internet who had never seen the original code. By mid-1991, they had replaced all the necessary files except for six, and released this package as ‘Networking Release 2.” Within 6 months, users had written replacements for the six remaining files, and BSD was distributed as a fully free, open-source operating system. After the initial release of Networking Release 2, a company called Berkeley Software Design Incorporated (BSDI) began developing their own replacements for the six missing files. They began selling their version of Unix in early 1992 for $995, which they advertised as a 99% discount over AT&T’s system.23 Despite the fact that there were at least two other Unix derivatives based on the BSD code base that were available for free, BSDI was sued by Unix Systems Laboratories (USL), the subsidiary of AT&T that developed and sold Unix, shortly after they began their advertising campaign.24 USL was attempting to get an injunction against the sale of BSDI’s product, claiming that it contained USL code and trade secrets. BSDI explained that, save for the six additional files, they were simply using the code they had received from the University of California. USL then re-filed the suit against both BSDI and the University of California. USL’s case began to falter as the Berkeley group demonstrated that their code had been developed independently from AT&T’s. In fact, they even managed to show that AT&T had removed the copyright notices from some of the BSD code and incorporated it into their Unix, thereby violating one of the loosest software licenses in existence.25 The lawsuit continued for over a year, but by that point, AT&T had sold USL to Novell, who agreed to settle out-of-court. In the end, three out of 18,000 files were removed from BSD’s code26, and BSD continued to develop and distribute their software, which has split into three major free software projects: NetBSD27, which supports as many types of computers as possible, FreeBSD28, which concentrates on Intel-based computers, and OpenBSD29, which focuses on security. In 1991, around the same time that BSD’s Networking Release 2 was released, a 21-year-old university student in Finland was working on his own free operating system. Linus Torvalds began working on Linux as an experiment to learn more about operating systems and the hardware of an Intel-based machine. It started as being based on Minix, a version of Unix intended for academic purposes that one could purchase the source code to for $150. Obviously not thinking much of it at first, Torvalds quickly attracted interest in his project, and more and more people began working on Linux. Participation grew quickly, partially due to the its ability to run on cheap Intel-based computers, and partially due to Linus' charisma. By early 1992, it had soon become a useful, independent operating system, and Linus released it under the GPL. What had started as an individual hobbyist project rapidly attracted hundreds of developers and thousands of users. While initially limited to only running on Intel-based hardware, hackers from around the world wrote the code to enable Linux to run on numerous types of computers. In the strict sense, Linux refers only to the Linux kernel – the very base of an operating system. In order to have a useful system, one requires many other utilities and programs. Many of these programs were provided by the GNU project, while others are the result of independent developers. (Because of Linux’s extensive use of GNU software, Stallman insists that the operating system be referred to as GNU/Linux, to give credit to his project.32) When one downloads Linux, one usually downloads a group of these programs in addition to the Linux kernel. This is known as a ‘distribution’. Not only do distributions provide a certain cluster of useful applications, but also they often have their own installation process, and method for installing and removing applications. These technological advances, combined with Linux’s enthusiastic user community, resulted in phenomenal growth. Many network administrators and information technology workers began to sneak Linux into their offices, finding the free software much more reliable and easier to administer than the proprietary solutions favored by management. PHP40 (a recursive acronym for PHP: Hypertext Preprocessor) is a free software programming language used to create dynamic web pages. It has become the world’s most popular server-side scripting program, running on over 9 million websites – 24% of all websites. PHP usage has grown 6.5% each month for the past two years. Although it is not yet as popular as the projects mentioned above, an extremely promising free software project on the desktop is OpenOffice.org.41 OpenOffice.org is a fully functioning open source office suite, including a word processor, spreadsheet, presentation manager, and drawing tool. Sun Microsystems released the source code to its StarOffice suite to create the OpenOffice.org project in July 2000. The project aims to reach parity with Microsoft Office, and recently had its 1.0 release in May 2002. It should be noted that this senior project was composed entirely in OpenOffice.org. As free software continued its rise within the computing community into the mid-90s, several key players in the movement began to worry that it was in need of a face-lift. Free software was seen by the conservative business community to be, at best, anti-business, and at worst, communistic. Such ideas arose mostly out of what hackers refer to as FUD (Fear, Uncertainty, and Doubt) regarding the changes that were taking place within the software industry. Nonetheless, it was felt by some that in order for the ideas of free software to truly take off within the marketplace, a public relations campaign was in order. That announcement is sometimes referred to as the “shot heard ‘round the world.’”47 For a corporation as high profile as Netscape – whose browser was the web’s most popular in its early days (before it was beaten by Microsoft through what many believe were anti-competitive practices) – to release its proprietary product as open source at first seemed insane to many. Regardless, it introduced free software as a legitimate idea to the business community. The media began to publish story after story about this odd phenomenon, and soon the world knew about Linux. Though long in development, the open sourced web browser based on Netscape’s code, know as Mozilla,48 recently released the first production version of their product in June 2002. Open source software played a very important role in the technology market explosion of the late 90s. Rising dot-coms and technology companies seeking to stretch their venture funding as far as possible made extensive use of free software solutions. For example, I personally worked for a company that employed several open source applications, running on top of Linux, in the product they marketed (which, ironically, was intellectual property management software!). Without the availability of open source applications such as Perl, MySQL, Apache, CVS, and Linux, the company would have had to close its doors much sooner than it did. In the years that followed, free software has gained more use, legitimacy, and acceptance. In December 2000, IBM announced that it would dedicate nearly $1 billion to open source development, advertising, and services.49 IBM, Dell, and Compaq all sell servers running Linux. Oracle now supports a version of its industry-leading, proprietary database software that runs on Linux. Apple’s new OS X operating system consists of a proprietary front-end running on top of a modified, yet open source, version of BSD. Other major industry players which have either made commitments to free software include Sun Microsystems, Hewlett-Packard, AOL/Time Warner, Silicon Graphics, Motorola, Sharp Electronics, Amazon.com, and Yahoo.com. Linux can be found at gas stations50, it has been to the North Pole51, and has even traveled into space aboard the space shuttle.52 It has become a leader in the processing of computer-generated images – you can now find clusters of Linux boxes crunching numbers at Dreamworks SKG, Industrial Light and Magic, and Disney, and it has been essential in creating the special effects for big-budget movies such as Titanic, The Fellowship of the Ring, and Star Wars Episode I. Perhaps the best indicator of this trend is the changing response of Microsoft, one of the largest holdouts of proprietary software, and perhaps the company with the most to lose by free software's success. For a long time, Microsoft simply refused to acknowledge the existence of free software, dismissing it as hobbyist, an irrelevant trend, and wholly incompatible with business needs. Then, in October 1998, several internal Microsoft documents were leaked onto the Internet. These memos, known as the 'Halloween Documents,' address Linux and free software as a serious threat to Microsoft’s business, and consider various strategies to combat it, and show that free software has the world’s most powerful technology company worried.53 Since then, Microsoft has gone from merely spreading 'Fear, Uncertainty, and Doubt' concerning free software to addressing its strengths and weaknesses as a true business threat. It has launched ad campaigns against free software, has a web page that compares Linux to its Windows 2000 server software point by point, and has recently admitted that they have needed to change their business strategies to accommodate the competition generated by open source software.54 Even more indicative of free software’s acceptance and popularity is Microsoft’s cynically named ‘shared source’ program, in which it shares small pieces of its source code with partner companies under heavily restrictive non-disclosure agreements. While free software has been widely popular in server rooms for quite some time, only in the past few years has it gained support as a desktop operating system. Desktop window managers, such as the K Desktop Environment55 (KDE) and GNOME56 have made astounding advances in providing user-friendly graphical interfaces that surpass that of Microsoft’s Windows in terms of features and functionality. Additionally, a wide range of open source applications allow users to write documents, burn CDs, watch movies, send instant messages, and perform many of the other tasks a common desktop user would want to do – all cost-free. It is now possible to order new computers with Linux pre-installed from Walmart.com! Free software has come a long way since its humble beginnings in BSD and the GNU project. Sourceforge.net57, a website that hosts free software development projects, currently lists 27,057 projects under Open Source Initiative-approved licenses, and that number increases every day.58 It is estimated that the use of Linux alone increases 200% each year.59 In the next section, I examine what it is about free software that makes it so compelling. Open source software tends to out-perform its proprietary counterparts in a variety of areas, qualitative arguments for freedom aside. When examining free software, one will find that it is usually more reliable, more secure, performs better, or provides more functionality than a comparable closed source product, and often excels in more than one of these areas – not to mention that free software is almost always a better value. Linus Torvalds’s style of development – release early and often, delegate everything you can, be open to the point of promiscuity – came as a surprise. No quiet, reverent cathedral-building here – rather, the Linux community seemed to resemble a great babbling bazaar of differing agendas and approaches (aptly symbolized by the Linux archive sites, who’d take submissions from anyone) out of which a coherent and stable system could seemingly emerge only by a succession of miracles. A famous work in software engineering states that the more people you assign to an overdue project, the more overdue it will become, as the level of complexity between the developers increases. Written by Frederick P. Brooks in 1975, it reasons that the level of complexity, difficulty in communication, and the potential for bugs increase geometrically as programmers are added to a project.61 This idea is known as ‘Brook’s Law,’ and, of course, the existence of Linux tends to dispute it. Linux, and many free software projects since it, are developed by varying numbers of people, in a relatively decentralized fashion, with the primary (and often only) means of communication being email. While it’s not exactly the case that it is a non-hierarchical development model, the hierarchies are much less strict than one might find in a traditional software shop, and are very much merit-based. In most larger projects, there is at least one person, possibly several people, who serve to coordinate and manage the development (such as Linux Torvalds, in the case of Linux), but due to the voluntary and open nature of open source development, they hold those positions entirely at the will of the other developers. This point cannot be overstated. Because the developers of a program are often the ones who use the program the most, the features and issues they address are directly driven by consumer concerns. This practice is augmented by the fact that non-developing users have direct access to the programmers themselves when making feature requests, identifying problems, and providing feedback. Another custom related to this point is what Raymond identifies as “Release early, release often.”63 Open source developers make their code available in good working order through ‘development releases’ - testing versions – very often. This allows users to try out the software and identify any new issues that may have arisen, as well as test the latest features, keeping interest in the project high. For example, the Mozilla project (the open source web browser) allows interested users to download a new test version of their open source web browser every night. Another advantage to frequent release cycles concerns security and bug fixes. It is well known that Microsoft will delay the announcement of security problems with their software, sometimes for months, until they have a fix ready. Often the announcement is timed to manage public relations. This is not the case in the open source community – major bugs and security problems are announced immediately, and in most cases, fixes are available within days, sometimes hours, of identification. On the flip side of the ‘release often’ idea, most open source projects are never released as ‘stable’ or ‘production-ready’ until they have been thoroughly verified and tested. There are no sloppy rushes to meet production deadlines, no premature shipments to coincide with TV spots. An additional burden of profit-driven development usually not seen in free software is the forced upgrade. Much of Microsoft’s business model is based on the idea that consumers will be forced to continually purchase the latest and greatest operating system in order for their new programs to run. This proves not only costly, but can be quite confusing, as users must constantly reacquaint themselves with new systems every few years. In free software, developers go to great lengths to make software backwards compatible (new versions able to work with older versions), and to ensure that they are programming for the lowest common denominator. And, of course, when a new version does come out, it is available free of charge. Probably one of the biggest causes for the high quality of open source software seems to be overlooked by Raymond. The developers of free software have direct control over their work, and therefore do not risk becoming alienated from their labor, as is often the case in hierarchical corporate environments. Free software hackers perform their tasks not out of material necessity, but out of internal motivation – because they enjoy solving problems, they feel empowered by the community, they wish to see better software, etc. Another great benefit of the open source development model is that the number of people who are available to identify and correct bugs is only limited by the popularity of the project. In the closed source world, there are only as many debuggers as the company can afford to pay. It would be difficult for a traditional ‘cathedral-style’ development process to test its software as widely, in as many different environments, as is possible with the open source model. Although it is not uncommon for a project’s mailing list to receive an identified bug and its fix in the same email, Torvalds states that usually “somebody finds the problem, and somebody else understands it. And I’ll go on record as saying that finding it is the bigger challenge.”66 With a wide user base of non-programmers testing the latest development releases, the challenge of locating these bugs is spread among many. An important issue related to the idea of 'multiple eyes' in free software is security. Many critics point to the availability of source code as making open source software much less secure, since malevolent crackers can see exactly how the software operates in their search for security exploits. However, many in the security industry will tell you that 'security through obscurity' is no security at all. The alternative view is that, because of open source, more people who are interested in keeping the software secure can find the security exploits and fix them, whereas with closed source, the holes remain, they are just a little harder to find. Good software development models and ideas of freedom aside, free software must still interact with the free market, and programmers still must get paid. Most free software developers are hobbyists. While they often feel very strongly about free software, they usually work on it in their spare time, while programming in closed source environments to pay the bills. Many are not professional developers at all, but network administrators or academics. Some do not even have 'tech-related' jobs. Not all open source development is done for free. It is becoming more and more common for companies to pay programmers to work on open source software, as businesses begin to realize the potential of open source software. This may come as something of a surprise – why would a company pay someone to develop software that they cannot own? Red Hat views its software distribution as a commodity product – the actual costs and benefits between the various distributions available are negligible.71 In order to gain the large share of the distribution market that they enjoy, they have had to focus on brand management. People perceive Red Hat Linux to be the highest quality and most convenient distribution available. The Red Hat brand is partially successful due to its considerable contributions to the free software community – people know that Red Hat has used its success to improve the community – and thus the employment of developers has the additional benefit of improving the quality of their brand. Many trust the Red Hat brand so much that they “prefer to purchase ‘Official’ Red Hat Linux in a box for $50 when they could download it for free or buy unofficial CD-ROM copies of Red Hat for as little as $2.”72 By having a well-established brand, Red Hat can focus on selling that brand to new customers. “The challenge is to focus on market size, not market share. ... The more Linux users there are, the more potential customers Red Hat has for our [distribution].”73 And, of course, the users who subscribe to Red Hat’s brand are more likely to purchase Red Hat’s support services. Therefore, by contributing to free software projects, IBM, Hewlett Packard, and the like can force software companies such as Microsoft to compete with free (as in beer) products, thereby driving down the price of software. With cheaper software, companies are more likely to purchase more hardware. The same is true of the various support services that these and other companies provide: if the price of web servers falls, additional web servers will be installed, and hence demand for web server support will increase. It is, for the most part, agreed upon that free software development is rapidly altering the software industry, and the economics of the technology market in general; many go so far as to say it is a revolution.77 Regardless of the terminology used, there is no question that the phenomenon of open source software is forcing many to reconsider common assumptions in regards to software and the market. However, one finds drastically different interpretations of free software, coming from different perspectives. The next section will present a survey of different analyses of free software, focusing on the various perspectives from which they are written. Free software as a social phenomenon is a highly complex occurrence, and its existence goes against many commonly held assumptions regarding motivation, social organization, and economics. Additionally, as free software has gained momentum and popularity and become a powerful force within the software industry, it has developed real-world political and economic effects with wide-reaching implications. With these ideas in mind, it is not surprising to find that there exist many different, sometimes opposing, explanations of this phenomenon. Of course, these quotations represent the extreme of the two positions, and even the extremes recognize that this issue should not – and does not – divide the community to the point that it loses sight of its common goal – to spread the use of free, open-sourced software. This issue is only one of the most obvious of many differing interpretations, theories, and explanations related to open source software. By examining these various perspectives, we not only get a better understanding of the free software phenomenon, and how we have gotten to this point, but, as I will show in this section, differing assumptions concerning the nature of individuals and social institutions will lead us to vastly different conclusions. I have identified six articles that provide interesting and engaging explanations of free software development. I have grouped them by the differing perspectives from which they are written: Traditional Economic, Traditional Sociological, and Radical. Note that I in no way intend to imply that these are the only perspectives that can be found examining free software. While examining these articles, one finds that some of the same questions emerge over and over. We can assume that their frequency suggests they are central to the explanation of free software. However, each perspective emphasizes different issues related to these questions, and each provides different answers. I have chosen four of these questions that appear most often, and especially highlight the various interpretations the three perspectives have to offer. The first question deals with the motivations of individual free software developers: What are the factors that cause someone to invest great amounts of time and energy in participating in open source development? The second question relates to the management of free software development. As explained previously, some of the larger free software projects, such as Mozilla and Linux, are extremely complex, and the independent developers sometimes number in the thousands. What sort of organizational structures and practices are needed to manage these projects? The third question addresses the larger economic issues surrounding open source. As free software becomes more popular, it inevitably has an effect on the software industry, especially as it begins to compete directly with proprietary products. How does free software interact with the marketplace, and how is the proprietary software responding to open source? The final question focuses on the future of the free software movement. As this type of software development continues, where is free software going, and what are its long-term implications? Josh Lerner and Jean Tirole’s “The Simple Economics of Open Source” sets out to account for open source development within existing theoretical economic frameworks. The Cathedral and The Bazaar, by Eric Steven Raymond, is an ethnographic account and economic analysis of the free software community from its most prominent self-described anthropologist and libertarian. The final two articles are similar in that they attempt to explain the free software phenomenon primarily through the traditional rules of market economics. Because they both assume human beings as rational, self-interested, and autonomous, and because they focus on individual behavior as opposed to the larger social context, I place them in a traditional economic perspective. Lerner and Tirole, in “The Simple Economics of Open Source,” begin to explain the open source developer’s motivations as follows: “A programmer participates in a project ... only if she derives a net benefit [which is] equal to the immediate payoff (current benefit minus current cost) plus the delayed payoff.”81 Immediate benefits and costs include monetary compensation (if it is a commercial project), “fixing a bug or customizing a program for her own benefit,”82 and the opportunity cost of time spent, meaning that the developer is unable to engage in other activity while working on this project. Delayed rewards consist of the ‘career concern incentive,’ which “refers to future job offers, shares in commercial open source-based companies, or future access to venture capital,”83 and the ‘ego gratification incentive,’ or peer recognition. These incentives are grouped together as the ‘signaling incentive.’ They then explain that, while commercial projects “have an edge on the current-compensation dimension,” open source projects, “may well lower the cost for the programmer, for two reasons.”84 The ‘alumni effect’ results from the fact that open source software is often used at schools and university as a teaching tool, and thus programmers are often already familiar with it. Additionally, if working on the software brings about a private benefit for the developer, then, too, the cost of contribution may be lowered. In open source development, the ‘signaling incentive’ is stronger than in traditional settings, for the following three reasons: Because of the open source code, it is easier to measure one’s performance by directly observing the quality of one’s work. The “open source programmer is her own boss and takes full responsibility for the success of a subproject.”85 Finally, the “labor market is more fluid in an open source environment,”86 allowing developers to easily switch from project to project as they see fit. Raymond folds his reputation-based analysis into the notion of a gift culture. He argues that “human beings have an innate drive to compete for social status,”90 and that “most ways humans have of organizing are adaptations to scarcity and want. Each way carries with it different ways of gaining social status.”91 In our exchange-based economy, “social status is primarily determined by having control of things ... to use or trade.”92 The gift culture, as opposed to other methods of organization, is an adaptation “not to scarcity but abundance.”93 In gift cultures, social status is determined by what you give away. Raymond proposes an additional model to explain motivation, which he labels the ‘craftsmanship model,’ which addresses the “pure artistic satisfaction of designing beautiful software and making it work.”94 Yet he contends that these models are complementary – craftsmanship relies on reputation as a measurement of quality. Whether reputation is the developers’ primary motivation or not, the reputation given by the community will affect their behavior. Lerner and Tirole’s analysis suggests that the most important aspect of a successful free software project’s organization is the presence of credible leadership. Heads of open source projects must provide a vision, ensure that the overall project is divided into smaller, independent tasks, attract other programmers, and “keep the project together”95 (prevent it from forking96 or being abandoned). Another strategy is to “take a more proactive role in the development of open source software.”112 A company may release source code to a product while creating a governance structure for the process, thereby retaining some influence over the direction of development. There have also been efforts “to certify corporate open source development programs.”113 Lerner and Tirole suggest that it makes good sense to hire prominent open source developers when a company wants to benefit from open source, as the developers act as intermediaries that gain the trust of other members of the community. Raymond then points out that “only sale value is threatened by the shift from closed to open source; use value is not.”125 He goes on to describe two business models that support funding of open source projects for their use value. One involves sharing the cost of developing a particular program among many parties; the other relies on preventing the risk of a program outlasting its original developers by spreading its maintenance among a community. Steven Weber’s “The Political Economy of Open Source Software” addresses questions involving the motivation of individuals, the coordination of free software development, and the complexity of open source projects. He then steps through an explanation of free software that combines microfoundations, economic logic, and socio-political structure in which he argues that the most compelling aspect of, and biggest challenge to, open source development is the coordination of projects. Ko Kuwabara, in “Linux: A Bazaar at the Edge of Chaos,” describes open source as a highly complex system which approaches chaos. He combines complexity theory with ideas from evolutionary biology to describe free software as an evolving system that employs self-organization to maintain order. These articles are similar in that they place primary emphasis on the social structures surrounding open source development. The sociological perspective acknowledges that reality and perception exist within a social context, and that individuals are flexible beings subject to influence. Kuwabara mentions several personal motivations influencing free software developers, suggesting that the “most obvious reason for anyone contributing to the Linux project is enjoyment. Programmers program because they enjoy programming; programming directly satisfies utility, and utility is its own reward.”145 However, “enjoyment is an inadequate explanation by itself in that it fails to account for the norm of cooperation and the norm of ownership.”146 Another commonly cited motivation is that individuals program free software as part of their primary job, either being explicitly employed to develop a free software project, such as a Red Hat employee, or, more commonly, in a situation where one’s everyday responsibilities require open source programming, such as a network administrator. Kuwabara extends his ideas of ‘group efficacy’ and reputation to describe a self-feeding cycle in which a developer is attracted to and contributes to a promising project, gaining a certain degree of reputation within that project’s community. This added reputation persuades the developer to stay involved with the project, while improving the overall quality of the project, drawing in more developers. in the software industry, the New Class ideology finds perhaps its purest expression in the GNU Public License.... Part legal documentation, part political manifesto, Copyleft formulates into concrete and binding terms the norm of cooperation in hacker communities that began to lose its ground against the growing tide of commercialism. Weber’s statements on the economics of open source software focus on the notion of free software as a public good. There is no way for anyone to restrict access to free software, and thus it falls into the economic category of ‘non-excludability.’ Additionally, anyone may download free software “without decreasing the supply that remains for others to use,”178 so it is described as ‘non-rival’ as well. Normally, goods that are non-rival and non-excludable “tend to be underprovided in non-authoritative social settings.”179 This is due to the fact that individuals can use the good as a ‘free rider,’ with no need to contribute towards the development of the product. Why, then, does free software receive the large amount of development that it does? Weber cites the individual motivations as part of the answer, “but there is also at play a larger economic logic.”180 Due to the nature of the Internet, when a piece of software is made available, it is possible the product could be used millions of times, without inhibiting its original producer’s use at all. To that producer, “multiple copies of this single product are not very valuable.... But single copies of multiple products are immensely valuable. ”181 Thus, “giving away a million copies of something, for at least one copy of at least one other thing ... is a good trade.”182 However, this still does not adequately explain the ‘free rider’ issue, as “no trade is necessary at all. It is still a narrowly rational act for any individual to take from the pot without contributing.”183 The solution, he explains, “lies in pushing the concept of non-rivalness one step further.”184 He describes free software as actually being ‘anti-rival’ – “the value of a piece of software to any particular user increases, as more people download and use the same software on their machines.”185 This is due to factors such as compatibility and debugging. As long as there is a core group of developers who do contribute, “the system positively benefits from free riders.”186 The previously mentioned incentives and motivations sustain the development of these core groups. The second implication he suggests involves the idea of ‘path dependence,’ which refers to the difficulty in switching from an existing technology infrastructure to a better one, due to the massive investment required, as well as the incentives beneficiaries of the incumbent technology have to block such a switch. He states that free software, particularly Linux, “is currently challenging that equilibrium and may overturn it in the not so distant future.”189 However, it isn’t clear that open source will be able to “overcome its own related deficiency of path dependence.”190 In other words, should Linux become a sub-optimal system in the future, will the community be able to make the switch to better technology? The third idea relates to the setting of technology standards. It centers around the “politics and particularly the international politics of standards setting.”191 Open source has already shown that it has the ability to form standards around its products. However, because the community has no formal representation, and bears no allegiance even to particular countries, how will it interact with formal standards processes? Eben Moglen’s “Anarchism Triumphant: Free Software and the Death of Copyright” concentrates on open source in relation to intellectual property and current copyright policies. In it, Moglen (who, incidentally, is the pro bono legal counsel for the Free Software Foundation) states that all forms of information, in their digital form, are virtually indistinguishable, yet different types of information carry vastly different legal implications. He then argues that free software is the first example of individuals, through the increased communicative power of the Internet, restructuring ideas of intellectual property. Johan Söderberg’s “Copyleft vs. Copyright: A Marxist Critique” discusses how Marxist theories, such as historical materialism, can be applied to free software and information in general. Because traditional Marxists view society as primarily being linked to its material base, they place little weight in the analysis of information. Söderberg defends the importance of information, citing that the current state of technology has substantially changed the value of information in relation to labor. Both articles approach free software in ways that give great importance to power structures and social conflict, and call into question traditional economic assumptions concerning property and labor. They also place less emphasis on the individual motivations and concerns of free software developers and more on the larger societal implications of free software development, and maintain a positive view of human nature. Thus, I label these articles as coming from a “radical” perspective. The second answer Moglen describes as being partially right – the argument that “free software is made by those who seek reputational compensation for their activity. Famous Linux hackers, the theory is, are known all over the planet as programming deities. From this they derive either enhanced self-esteem or indirect material advancement.”196 However, the most famous developers have not done the bulk of the work: “Reputations, as Linus Torvalds himself has often pointed out, are made by willingly acknowledging that it was all done by someone else.”197 Additionally, free software often has very good documentation, yet writing documentation is not something that gains one status. Thus, while reputation motives exist, there must be other factors involved. The rest of the explanation is described through the account of Vinod Vallopillil, a Microsoft employee who wrote one of the leaked internal analyses of Linux known as the “Halloween Documents.” In it, he describes downloading the source code to a common networking protocol: “I’m a poorly skilled UNIX programmer but it was immediately obvious to me how to incrementally extend the DHCP client code (the feeling was exhilarating and addictive).”198 The availability of free software allowed for an increase in Vallopilli’s ability to create, which he found exhilarating. Moglen states that it is “an emergent property of human minds to create.”199 Thus individuals participate in free software development because it allows them to create in ways otherwise unavailable. In explaining the free software development model, Söderberg cites Raymond’s The Cathedral and the Bazaar, but criticizes it as being simplistic. The various perspectives address key questions in ways that reflect their assumptions about human behavior and social structures. In regards to the personal motivation issue, the economic perspective places great significance on rational individuals weighing self-interested motivations, while the sociological perspective points to identity within a group as the primary motivation, and the writings identified with the radical perspective give much more weight to the innate creative function of human beings. The economic approach tends to focus on the hierarchies and leadership structure of free software communities, in keeping with their focus on entrepreneurship and individualism. The sociological explanation lies in examining the importance of the groups involved, and the difficulties in managing and coordinating such highly complex projects. The radical perspective pays little attention to the organizational structure of free software projects; the articles are interested in this issue only in its relationship to larger issues at hand (the potential of the Internet, and the freedom from capitalist control). The economic articles approach the relationship between free software and the software industry by explaining various business models that relate to open source. The two sociological articles take stances that reach beyond traditional economic explanations, emphasizing the cooperative potential of free software economics, while the radical perspective seems more interested in free software's effect on larger institutions of property and power. Regarding the future of free software, one of the economic articles addresses its managerial challenges, while the other envisions the its future co-existence with the commercial software industry. The sociological point of view attempts to identify the broad institutional implications of free software. In the two radical articles, open source development is posed as a potential way to alter existing power structures. Having surveyed various research perspectives and their views on several key free software issues, the following section will propose and discuss several implications of free software development, based on my research, education, and personal experience. However, it is important to note what I have drawn from the various perspectives – for my perspective certainly influences how I view free software. I agree with the radical view in terms of motivation; while there are certainly factors such as ego, identity, and signaling incentives involved, I believe the biggest factor influencing free software developers is the urge to create. In explaining the organizational model, I look primarily towards the sociological perspective. Free software development is an amazingly complex social system, and requires a more nuanced examination than provided by either of the other two viewpoints. With regards to free software and the marketplace, I accept points from all three perspectives. The impact on power relations, the potential of cooperative economics, and the notion of software development as a service all play into my analysis. As for future implications, the following section should make my opinions clear. One of the most compelling implications of free software development involves the previously mentioned 'New Class Theory.' Marxist class theory holds that a group of individuals is identified as a class because of their common relationship to the process of production. Human beings are, ultimately, tied to their ability to extract material resources from the environment and transform them into the items essential for life. It is through this social process that control over production of these material needs of society can allow one class to dominate another. In the traditional Marxist interpretation, there are two classes within a capitalist mode of production: the prime condition of the capitalist class, or bourgeoisie, is controlling the means of production; it is they who own the factories, machines, land, infrastructure, and other resources that make production possible. The second class is the proletariat, or working class; this includes any member of society that relies on the sale of labor for their well-being and survival. This class analysis is tied to another broader theory known as “Historical Materialism.” The relevant component of this theory states that, as the primary methods of production and distribution of material goods changes, so do the social relationships within a society. This, in turn, alters the power relationships between classes. Hence, as the agrarian feudal state was slowly undermined by the rising influence of markets, the power of hereditary lords and landed nobles gave way to the mercantile class. We can see, therefore, that the manifestations of class are malleable, and linked to the various technological and social forces that influence production. The traditional Marxist class analysis begins to lose relevance in the modern capitalist economy. The advances of the scientific, democratic, and industrial revolutions have created a production process much more efficient at creating surplus wealth, yet at the same time they make the system much more difficult to rationalize to its participants. The Frankfurt School of critical theory developed the idea that, in the modern era, there exist wide-reaching institutions whose purpose is to rationalize, legitimate, and facilitate the means of control through the production of culture and knowledge. This includes the various media, news, and advertising services, as well as academic and research institutions. All of these combine to influence the population into propagating a culture and value system that legitimates and promotes the power of the elite. As this structure of knowledge and culture production advances, however, its participants begin to carve out their own niche within the power structure. Technology has advanced to a point that, while material production remains central to the human condition, it is knowledge and information that retains the most value within the economy. The owning class must increasingly rely on a group of skilled workers that demand higher wages and greater autonomy within their field of work. These professional knowledge workers are able to retain indirect ownership of the products of their labor through the monopolization of knowledge within their respective fields. It is through this change that professionals begin to have a significantly different relationship to the process of production, with different goals, than either the owning or the working classes. Through their position, they are able to resist capitalist ownership and control over the knowledge they produce and the means by which they produce it, yet lack the connection to material production that is experienced by the working class, as well as reproduce and manage the systems of control that characterize capitalist class relations. The professional maintains power by retaining ownership of knowledge through expertise within the field, and legitimates this control by pointing to notions of rationality, efficiency, quality, and technical excellence. However, these ideas are defined by the subjective terms of that particular field. It is in this sense that the attempt of capital to maintain control of information is failing; it is losing legitimacy due to the efforts of the professional class to retain control within the class system. Thus we can see the goals of the professional class (to gain autonomy, to create specialized knowledge, to retain professional ownership of that knowledge within the field, and to do these things within the structure of 'pure' rationalism) is in conflict with the goals of the capitalist, who views knowledge production as a means for continued profit-generation and hegemonic control. As an example, consider the legal profession. Knowledge workers in this profession have managed to create great structural hierarchies within the field, including many sub-professions; they also create specialized terminology – a code language of sorts – to define issues and practices within the field. In these ways, legal professionals create and maintain a monopoly hold on legal knowledge; they have essential carved out a portion of the knowledge economy that remains uniquely theirs. The capitalist must then draw upon members of the legal profession, and essentially submit to the structures they have created, in order to successfully navigate the legal field. The reason this leap has occurred within software development, as opposed to other sectors of the knowledge economy, is due to the combined effects of several circumstances. Perhaps the most influential is the fact that these workers make up the front lines in the 'digital revolution' (a tremendous change in industrial development), and thus find it much easier to redefine production practices and relationships. The previous methods of hierarchy and control are not as set within the context of the digital age. A second, related, factor is the development of the vast social network that is the Internet, which, as we have previously examined, allows for unprecedented levels of cooperation and communication. Thirdly, the attempts by capital to maintain software as property, in spite of its non-rival nature, seems particularly illogical, and thus, this obvious contradiction makes resistance all the more expected. Finally, also related to the onset of digitalization, software developers find their skills in particularly high demand. This not only allows them more power and freedom, but their high salaries, in particular, permit them to occasionally forego the wage benefits of their production. Another important implication of free software lies in its potential tp increase the informational infrastructure for the public good, especially in traditionally underprivileged sectors of society. One such application is its use within public schools, and other organizations associated with civil society. Generally, these organizations are cash-strapped as it is; the increasing price of software only hurts the ability of a school to teach, of a non-profit organization to perform its day-to-day business, of awareness groups to do the necessary advertisement and reach-out. The no-cost aspect of free software eliminates expensive license fees, and could significantly decrease the overhead costs of these organizations. The typical business office environment requires no more computing tasks than word-processing, e-mail, web browsing, and the ability to share files and print services across a network. While free software isn't on the cutting edge of media playback, or gaming, or other specialized computer applications, there are dozens of methods to perform each of these day-to-day tasks within the realm of free software. In some aspects, such as stability and security, the free software applications out-perform their proprietary components. Consider the example of Philadelphia schools.218 When a teacher installed his school's only copy of Microsoft Office on several teachers' computers, Microsoft caught word and subjected the underfunded school district – all 264 schools – to a software audit to ensure that they possessed licenses for every piece of Microsoft software on every computer. Thus, the teachers in the district, whom the district could barely afford to pay, had to spend time taking inventory of every computer they could find. As a result of the negative public relations they received from the audit, Microsoft eventually 'worked out a deal' with the district, but the threat remains to any such organization. Finally, free software may have a significant impact on the workings of governments in relation to software. A government, like any modern-day bureaucratic organization, relies on computer and software technology for its day-to-day operations. Currently, when some governmental department requires a new piece of software, it either purchases an existing piece of software, or contracts a firm to develop it for them. Of course, the firm retains many of the ownership rights to the software, and is often able to resell it. Free software advocates argue two points in relation to governmental use of software. Rather than purchasing software, governments should always lean towards implementing open source solutions. This, again, is primarily due to the no-cost aspect, but also to the various technical and security advantages found in free software. The second point is that when new software is to be developed with public funds, that software should be placed in the public domain via free software licenses. Rather than subsidize a firm's intellectual property development, why not contribute to the public good, so that other governmental departments, or other organizations, can partake in the benefits of software that they partially paid for? In Peru, where dependence on proprietary software is considered another form of Yankee imperialism, the legislature is currently considering a bill that would require the use of free software throughout the government.222 Additionally, the governments of Germany, Taiwan, and China have made moves toward implementing the widespread use free software. Studies have been conducted by the United States, the European Union, and the United Kingdom on the viability and benefits of governmental implementation of free software.223 Open source is already used in many US governmental departments, including NASA and the FAA. Free software still has many challenges to face, and a number of them are of sufficiently significant magnitude to seriously limit its growth. One obstacle to the widespread use of free software involves the organization of the development process. As was brought up several times in the previous section, a free software project is an amazingly complex, yet fairly decentralized, organization. Should open source continue to rise in popularity, the number of contributors to projects, especially the most popular projects such as Linux and Apache, will surely increase as well. How will the co-developers keep up with the massive amount of submissions they will receive? How will they manage so many developers working in parallel? Will the structure of open source projects be able to handle the load? Another obstacle free software must face before it is universally accepted is usability. Free software has always been developed with technical quality and engineering efficiency in mind – this is one of the reasons why it performs so well. However, this practice can make things quite difficult for novice desktop users. Because usability has taken a back door to other technical criteria, and, until recently, projects were developed for 'geek' users anyway, using some open source programs can be frustrating for the average user. One aspect of this is integration. Free software projects rely on being modular in nature; code is separated into smaller, independent pieces not only for the technical advantages, but also out of necessity – parallel development would be extremely difficult without it. Similarly, programs often are written to do small tasks, but easily coordinate with others to perform larger tasks. This is good practice from an engineering perspective, but for a desktop user, it can make things difficult. For example, to burn a CD in Linux, one needs to have one program that sets up the CD image, and another to copy it to the CD. However, if one wants a point-and-click interface (as opposed to running these programs in a text-only command line environment), one needs a third program. The graphical component may or may not resemble the interface of the rest of the programs on one's desktop, depending on whether the program was made for the KDE desktop, or the GNOME desktop, or another desktop system. The issue of modularity leads to a larger question: will free software be able to step away from its traditional engineering-centered design principles and be willing to make compromises to more user-friendly designs? The Linux desktop, despite issues of modularity and geek-oriented software design, has come quite far in the past few years. The advances of the two primary desktop managers, which essentially have developed into mini-distributions of desktop applications, shows that there are a good number of developers out there who are dedicated to focusing on user interfaces and smooth integration of the underlying modular applications. After reading this quotation I remember thinking, 'that could never happen.' Shortly thereafter, I read about Microsoft's Palladium project. What Microsoft proposes is a hardware chip inside your computer that, working together with software embedded in its Windows operating system, would prevent one from running certain applications that the system deems 'insecure.' For a program to be deemed 'secure,' it would need to carry a digital certificate verifying that it had not been altered in any way since the certificate was applied. Microsoft states that the primary purpose of this system is to protect the consumer from viruses and to protect their privacy. Another, not so consumer-friendly possibility, would be to enforce Digital Rights Management, ensuring that you did not watch or listen to media that has been digitally reproduced without Hollywood's permission. There are many who believe that Palladium's primary purpose is to cripple open source software. It's possible that free software projects would not be permitted to 'sign' their applications under this scheme, and, even if they were, such a signature does not combine well with the free software process: signatures would be constantly invalidated by the rapidly changing code. Should such a system become widespread enough, it might become difficult to find computers without the Palladium chip, which would become a major hindrance to free software. It is rather unlikely that Microsoft could pull off such a scenario. They would be hard-pressed to convince consumers that such a system was developed with them in mind while removing all user control. And, as is most often is the case, such systems can always be circumvented in some way; someone will find a way around it, by either fooling the software, or disabling the hardware. I think that is important for me to explain that, despite the various benefits and potentials I have mentioned regarding free software, it is not without its problems. Free software is merely a tool, as is any form of technology. History has shown us that such tools can be used to enslave as easily as they are used to free. The Internet has proven to be a spectacular device to enable us to communicate more easily, but at the same time, our privacy has become threatened, and we are under increasing surveillance. Additionally, digital communication seems to have come, to some degree, at the price of physical contact. The nature of free software development is not without its problems. As stated earlier, its organization is based on hierarchy and ego; any gender analysis of the community shows that it is extremely overpopulated by men, and this fact is undoubtedly reflected in the software's development and application. The 'digital divide' is still quite wide, enormously so when considered on a global scale. It takes a great deal of privilege in order to have access to the Internet, let alone have enough surplus time to spend working on a project for which one receives no income. I merely want to point out that I do not have a utopian futurist's view of technology; our creations will always reflect the social structures that have created them. Perhaps the most intriguing point I want to consider is the possibility of applying the open source development model to areas of production besides software. One such possibility lies in the area of medical research. It is questionable how much longer the pharmaceutical companies can continue to restrict cheaply produced, sometimes life saving, treatments based in their claims to intellectual property. The notion that many must suffer or die because they cannot afford to pay for the knowledge a community has produced is becoming too crass for even our cynical society. Another similar application, perhaps the most glaring candidate, lies in the area of human genome research. As researchers study and discover the functions of human genetic code, it seems absurd to allow the privatization of the building blocks of human life; such information should be a public good. To restrict the process of discovering useful applications of this knowledge seems absurd; this is just the sort of innovation that the free software model would excel at promoting. However, medical research requires a great deal more infrastructure than does software development. A free research model would have to provide some manner in which to acquire the expensive materials and facilities needed. An area in which some of the notions behind free software seem to be taking hold is that of music production. Many independent artists are finding that by sharing and distributing their creations freely via the Internet, they are developing a loyal fan base – one willing to attend concerts and pay for full albums – much more quickly than relying on the industry to do their promotion and distribution. Another interesting application of open source principles is that of news distribution. As the major news organizations continue to become larger, their 'objectivity' becomes more and more questionable. There is a saying among those critical of the media conglomerates: “Don't hate the media, become the media.”228 The communications infrastructure of the Internet, combined with the falling cost of recording technology, has allowed many individuals to share first-hand coverage and analysis of news events with others around the globe. The Independent Media Center229 is a network of websites that allows visitors to post and comment on new articles in an unmoderated setting, which provide well thought editorial coverage of major events. There are over 89 affiliated indymedia centers providing local news coverage on every continent save Antarctica. As information continues to become more valuable in our society, and knowledge producers gain more control, there certainly will be more areas in which some of the techniques used in free software development might be applied. A final implication of free software is what its existence says about the concept of intellectual property. The notion of treating ideas as a form of property is supposed to encourage innovation, providing individuals an incentive to create new ideas. This project has shown that free software is a reaction against the commercialization of intellectual property, and that freedom from restrictive licenses, non-disclosure agreements, and other attempts to retain ownership of ideas has resulted in increased innovation and participation. Let us consider how one may 'own' an idea. If I write a new program, the intellectual property regime says I may own this program, and therefore may restrict its use as I see fit, provided it is not an obvious copy of someone else's program, or uses someone else's code. But was I alone in writing the program? What about the developers who created the language the program was written in? Where did I get the idea for the program? Perhaps it was from existing programs that I thought could be improved upon. If I write a program that uses a standard graphical interface, was it my idea to use a mouse? This line of thought can be extended ad infinitum. Who built the computer it was written on? Did I use the Internet for ideas? What about its developers? Who provided the electricity to run my computer machines? How did I feed myself while I was writing the program? Certainly, without the help of all these people, my program could not have been written. Shouldn't they have partial ownership of my idea? My point is that the creation of ideas is, just like any human endeavor, a highly social process. The imposition of ownership and restrictions on that process inhibits the growth and development of future ideas. And any idea that does exist will either be eventually improved upon, or die. An idea that is not shared is an idea wasted. In many ways, the restriction of knowledge proves immoral as well as stifling. Consider the previous example of the elementary school that could not teach children properly without the word processing program; the developing nation that requires certain technologies in order to develop infrastructure; or, perhaps the most atrocious example, thousands upon thousands of people suffering and dying from a disease because they cannot afford the high price a pharmaceutical company places on the information it owns. There is something tragically wrong with such a system that restricts the social process in such a way. Again, I propose that intellectual property is primarily used as an attempt by those who have always benefited by owning property to extend their power into the information age. We will see continued efforts by the intellectual property regime to restrict the use of information for their own benefit, while at the same time, there will be many who resist these attempts and will work toward the further freeing of information. As media moguls, technology capitalists, and pharmaceutical giants wage war against the defenders of information, it will be a challenging fight, but I believe that, as always, history is on the side of freedom. In this project, I have shown that free software development is an interesting phenomena that leads us to reconsider many commonly-held assumptions regarding the nature of software, production, and intellectual property. Although there is a range of debate originating from various perspectives on the issue, it is widely viewed that free software is significantly affecting the economics and structure of the software industry, and it holds great potential to cause change in areas beyond software. Although it faces many challenges, the existence of free software raises important questions in relation to makeup of social class, the nature of knowledge production, and the feasibility of intellectual property in the digital age. Chris DiBona, Sam Ockman and Mark Stone. “Introduction,” Open Sources: Voices from the Open Source Revolution. Ed. Chris DiBona, Sam Ockman and Mark Stone. San Francisco: O'Reilly, 1999. Marshall McKusick. “Twenty Years of Berkeley Unix: From AT&T-Owned to Freely Redistributable.” Open Sources: Voices from the Open Source Revolution. Ed. Chris DiBona, Sam Ockman and Mark Stone. San Francisco: O'Reilly, 1999. Bruce Perens. “The Open Source Definition.” Open Sources: Voices from the Open Source Revolution. Ed. Chris DiBona, Sam Ockman and Mark Stone. San Francisco: O'Reilly, 1999. Eric Raymond. The Cathedral and the Bazaar: Musings on Linux and Open Source by an Accidental Revolutionary. San Francisco: O'Reilly, 1999. Richard Stallman. “The GNU Operating System and the Free Software Movement.” Open Sources: Voices from the Open Source Revolution. Ed. Chris DiBona, Sam Ockman and Mark Stone. San Francisco: O'Reilly, 1999. Peter Wayner. 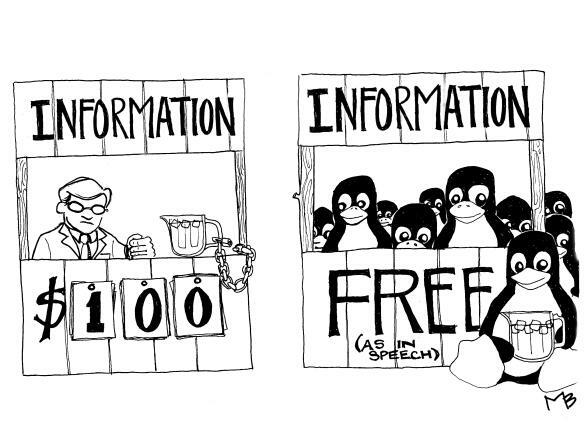 Free for All: How Linux and the Free Software Movement Undercut the High-Tech Titans. New York: Harper, 2000. Robert Young. “Giving It Away: How Red Hat Software Stumbled Across a New Economic Model and Helped Improve an Industry.” Open Sources: Voices from the Open Source Revolution. Ed. Chris DiBona, Sam Ockman and Mark Stone. San Francisco: O'Reilly, 1999. The indented, italicized sections below appear as annotations to the Open Source Definition (OSD) and are not a part of the OSD. The program must include source code, and must allow distribution in source code as well as compiled form. Where some form of a product is not distributed with source code, there must be a well-publicized means of obtaining the source code for no more than a reasonable reproduction cost?preferably, downloading via the Internet without charge. The source code must be the preferred form in which a programmer would modify the program. Deliberately obfuscated source code is not allowed. Intermediate forms such as the output of a preprocessor or translator are not allowed. 1“This is a mind-bogglingly large pile of dough. No other nonfinancial firm has more liquid money at its disposal, and only a handful of banks do. It's more cash than Ford, ExxonMobil and Wal-Mart have combined, and nearly four times as much as Intel, the tech company with the next largest cash balance. It is enough to buy the entire airline industry -- twice. Or all the gold in Fort Knox, four times over. It is enough to buy 23 space shuttles or every major professional baseball, basketball, football and hockey team in America.” Jim Frederick, “Microsoft's $40 billion bet,” CNN Money, July 26, 2002, http://money.cnn.com/2002/04/12/pf/agenda_msft/index.htm, accessed July 30, 2002. 3While there is some debate (discussed later) within the software community as to the specific meanings of the terms 'open source' and 'free software,' I use the terms interchangeably here. 7 I use the term 'hacker' as it is used within the software community – someone who uses computers and programming to identify and solve problems. The media has adopted this term to mean “someone who breaks computer security systems,” while most hackers use the term 'cracker' to describe such individuals. 30Rajib Hasan. History of Linux. http://ragib.hypermart.net/linux/, accessed July 30, 2002. 31Eric Raymond. The Cathedral and the Bazaar: Musings on Linux and Open Source by an Accidental Revolutionary. San Francisco: O'Reilly, 1999. p. 30. 34“Supercomputers getting Super-Duper,” news.com, June 20, 2002. http://news.com.com/2100-1001-938032.html, accessed July 30, 2002. 35David Wheeler. “Why Open Source Software / Free Software (OSS/FS)? Look at the Numbers!” http://www.dwheeler.com/oss_fs_why.html, accessed July 30, 2002. 50“Q&A: Red Hat says Linux can't beat Windows,” zdnet.com, February 5, 2002. http://zdnet.com.com/2100-1104-828802.html, accessed July 30, 2002. 51“Penguins Invade the North Pole,” linuxdevices.com, May 4, 2002. http://www.linuxdevices.com/articles/AT4739871225.html, accessed July 30, 2002. 52“Debian Flies on the Space Shuttle,” Debian Gnu/Linux News, April 1, 1997, http://www.debian.org/News/1997/19970401, accessed July 30, 2002. 54Rich Cirillo. “Ballmer: Linux Changed our Game,” Varbusiness.com, July 15, 2002. http://www.varbusiness.com/file/36355.html, accessed July 30, 2002. 61Steven Weber. “The Political Economy of Open Source Software.” BRIE Working Paper. June, 2000. 76Joe Spolsky. “Joe on Software: Strategy Letter V.” June 12, 2002. http://www.joelonsoftware.com/articles/StrategyLetterV.html, accessed July 30, 2002. 80Don Marti, “Day Two Download,” LinuxWorld On-Line, http://www.linuxworld.com/linuxworld/linuxworldtoday/lwt-behind2.html accessed July 30, 2002. 96A 'fork' is when a software project splits to become two (or more) projects with separate code bases. It is often the result of differences in project visions, or engineering philosophies, or other disagreements, and is extremely discouraged is the free software community. 216One might contend that individuals in such an environment would not be learning the most widely-used applications; that listing OpenOffice experience on one's resume is not as significant as familiarity with MS Office. However, I would argue that the most important skill to learn is simple exposure to them; once one gains experience with the various metaphors of a point-and-click interface, and the basic operations of a computer (i.e. Saving to a floppy, or browsing the internet, or copying a file across the network) the specific details of any application or operating system are easily learned. 226It should be noted the Bitkeeper is a closed-source program, and its use with the Linux kernel was subject to much debate. 228This quote is attributed to punk rock star and social activist Jello Biafra.